← I’ve Joined the Kindle Community! As I explained in Battling with French Administration, I have only started voting relatively recently and this is only my second French presidential election. The first time, we were here for both rounds. Of course, it would be much easier if they adopted the preferential voting system in France, but having the two rounds is all part of the strategy and I don’t think any of the politicians would agree to eliminating the second one! This time, however, we will be in Blois the second time around. Black Cat will be away on both occasions. So how do we go about voting? First, I’ll describe the normal voting system. When you become eligible to vote, you have to register with your local town hall. It’s wherever you’re registered on 1st January that counts. We are registered in the 1st arrondissement. 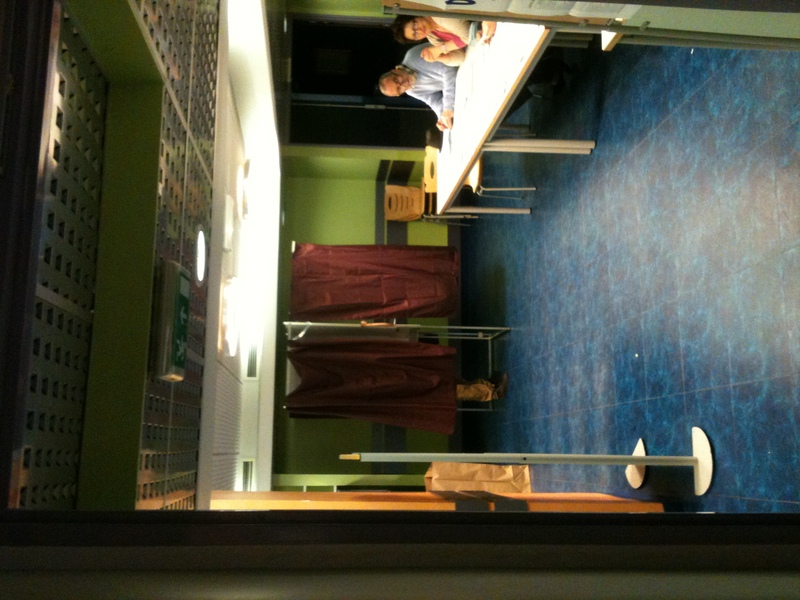 Even when they move (provided they don’t go too far away), most people prefer to keep their original voting office rather than spend hours waiting around in queues to change it. In about March, you receive an electoral card with the address of the polling station (usually a school) that you have to take along with you to vote, together with your ID. You hand them both over to the person sitting behind a table with all the ballot papers (bulletins de vote) in front of them. After they check your ID, they give you a little blue envelope and you take a copy of each ballot paper (10 this time because there were ten candidates) and go into the voting booth (isoloir – love the name! ), put your paper in the envelope and throw the others in the bin. Since we also receive the ballot papers by post, I prefer to select mine before I go. It’s a simple piece of white paper, about 10 cm x 15 cm with the name of the candidate printed in black ink. Then you go to another table, with your envelope and ID. 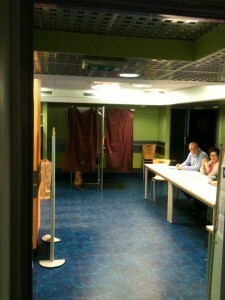 At our voting station, there are tables on either side of the see-through voting urn with a person at each table. One has the register with half the alphabet and the other has the rest. The person standing behind the urn reads out your name. After it’s located on the register, you sign and the urn keeper pulls back a lever so that you can drop your envelope in. When you have done so, he says in a stenorous voice, “A voté” (has voted). It’s all very formal. I was actually surprised they let me take photos but the urn keeper was very pedagogical, explaining everything to me in detail. 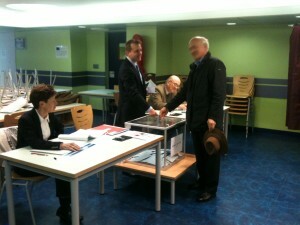 Now if you can’t physically go to your polling station on D-Day, the only solution is to find someone to represent you. They don’t have to be attached to your polling station (they just have to live in the same town), but they do have to go there to vote for you. You have to go along to the police station beforehand with the details of your proxy (full name, birth and place of date), your ID and your electoral card. You’re given a little bit of paper that says “récipisse à remettre au mandant” (receipt to be given to the proxy) that you hand over with your ID. 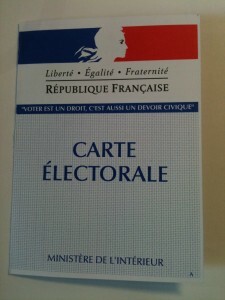 A proxy can vote for one person living in France and one person living overseas. 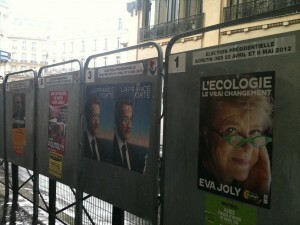 This entry was posted in France, French customs and tagged presidential elections in France. Bookmark the permalink. 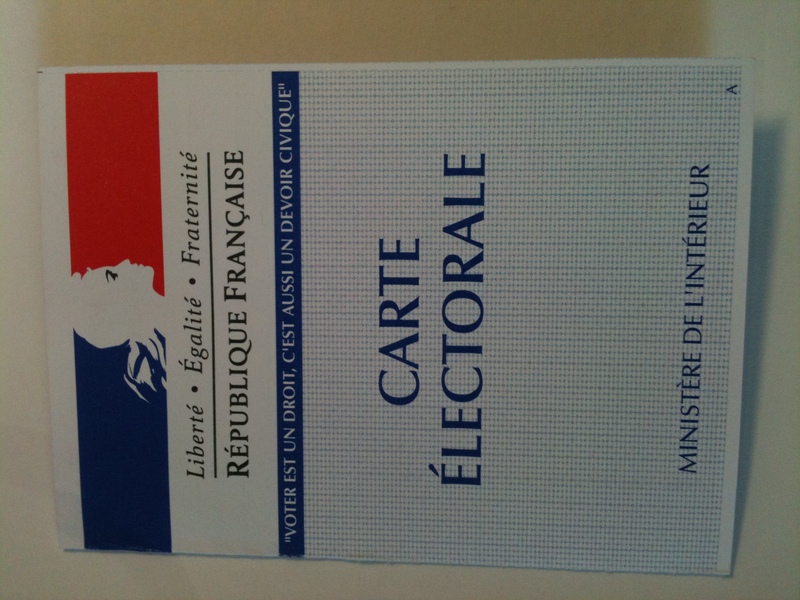 I’m about to tackle bureaucracy and become – hopefully – a French citizen so I can vote in the next Presidential elections. Wish me luck! Good luck! though as I explained in Battling with the French Administration, applying for French citizenship actually turned out to be very easy.It always takes a year though. It’s going to make your like much easier! 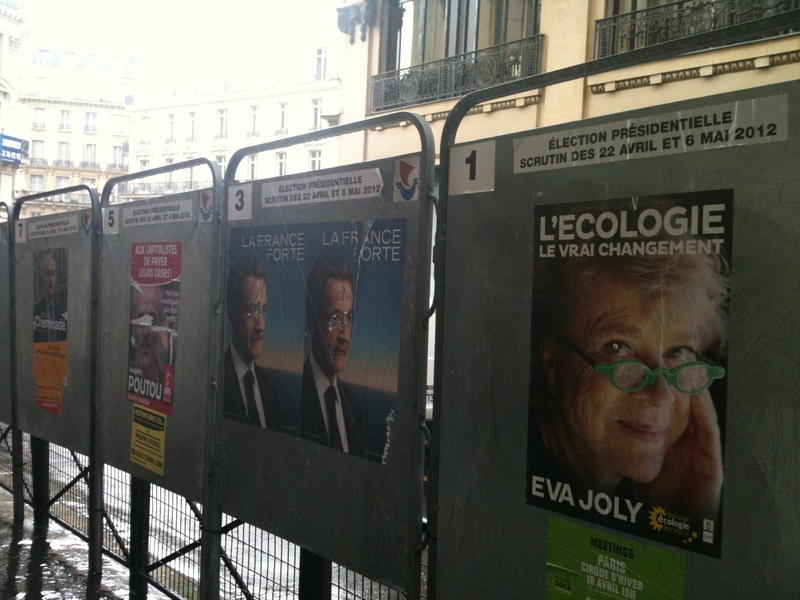 Fraussie, thanks for the interesting details of French voting procedures. Is this procedure for ordinary elections as well as presidential elections? As we go to local government elections tomorrow in QLD, it will be a little less involved – front up to the person behind the table, give your name – no ID, just your address, they find you in the electoral roll and cross you out. You receive the ballot paper, fill it out and place in the ballot box. I wonder how long it will be before we will need ID and signatures when voting! This is, indeed, the normal voting procedure in France, regardless of whether it’s for presidential or other elections. I love the way it works in Australia! Australia remains one of the few countries that still don’t have a national ID card. Here, you can be asked for it under all sorts of circumstances and you must always carry it on you. It took me years to remember!